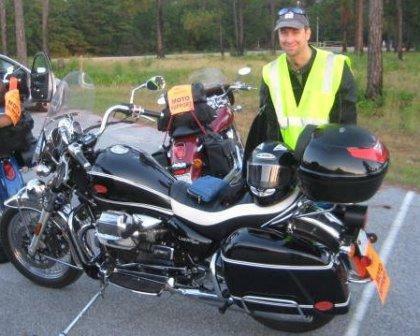 After a very fulfilling weekend of riding my Moto Guzzi California as a volunteer motorcycle marshal in the Bike MS Breakaway to the Beach, I share some thoughts from this really great experience. The practice ride proved helpful. I’m already looking forward to doing it again and would encourage other motorcyclists to volunteer as marshals similar for similar events in their area as a way to contribute by using your motorcycle. 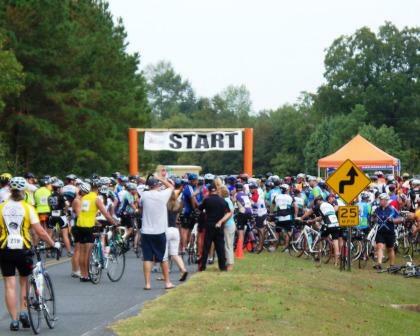 Before getting into the motorcycle part of it, I’ve got to mention that the approximately 1500 bicycle riders in the event were awesome for what they endured during their effort to help put an end to MS. The ride was split into different starting points and distances for each day. On the first day, the burning sun and unseasonably high temperatures made it very tough for everyone. The second day ended with heavy rain and thunderstorms. 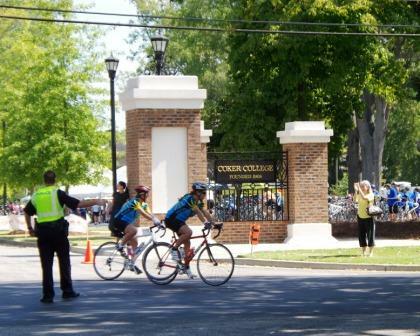 Having never been to a large bicycle event like this before, I was truly amazed at how far people can pedal a bicycle in one day, especially in the heat. 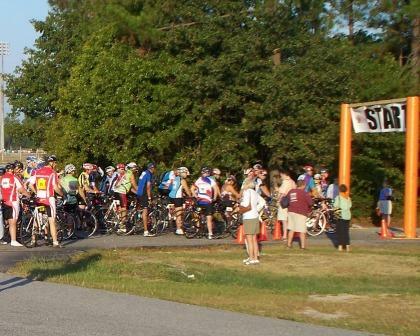 Many did 75 to 100 miles on day one, and then another 50 miles or more on day two. Some did even more than that. Rest stops were set up about every ten miles, but I saw a lot of teams push past several stops at full pace like human powered freight trains with just a woosh of wind noise as they passed by. Amazing to see really. I noticed how hard it was for some of the less experienced riders as I kept a lookout for them while I cruised the route on my Moto Guzzi looking for riders in need of help. I parked at some of the intersections to alert them of any traffic situations and also so approaching traffic would be aware that something was going on. The flags that one of the other volunteer marshals made really came in handy to help us get the attention of the cyclists and cars. Installing the four way flashers on my motorcycle prior to the event proved to be well worth the effort. 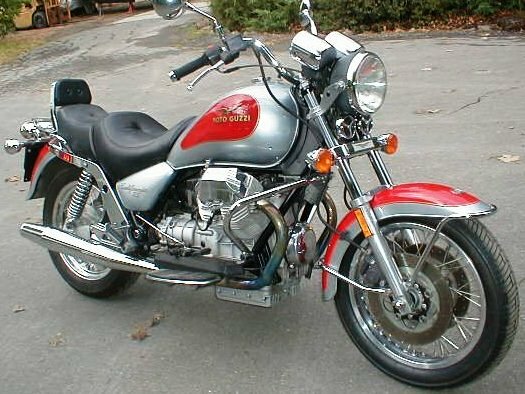 Some motorcycles come with hazard lights, but my Moto Guzzi California did not. As anticipated, I had to pull over several times to assist riders along the roadside. With the entire route open to regular traffic, having hazard lights flashing really helped. The marshals and SAG (support and gear) vehicles had them on almost all the time while on the course. It made us more visible to traffic and to the participants as well in case they were looking for some help. 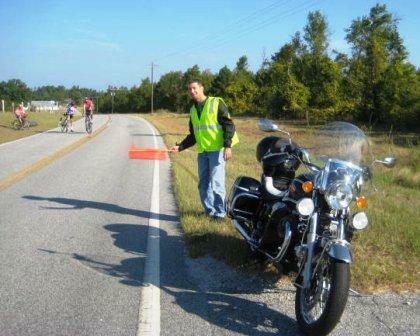 Some of the situations that motorcycle marshals can assist with are locating sick or injured cyclists and calling in for medical help; increasing visibility at busy intersections and in regular traffic by using our motorcycles, flags and reflective vests; being on the lookout for riders that seem to be having trouble from overdoing it before they end up with more serious issues; and patrolling the course for other dangers such as road hazards and dogs trying to chase the bicycle riders. 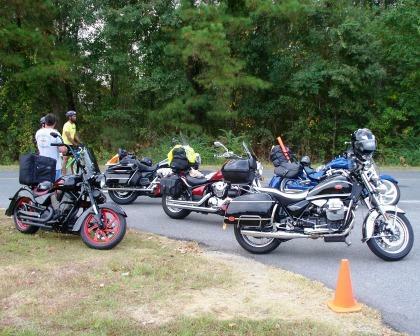 I learned several things as a first-time motorcycle marshal for this 2-day event. 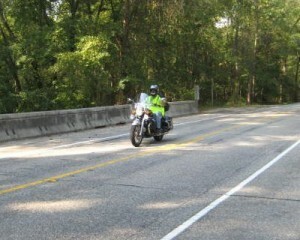 First, the more riding experience you have as a motorcyclist, the better for being a marshal. Slow speed maneuvering in confined spaces was one of the main things the motorcycle marshals had to do during the event. It takes practice to keep sharp with it, and I found myself being challenged by uneven surfaces (roadside shoulders, gravel, sand, etc.) every time I stopped to assist a bicyclist along the course. It’s amazing how much broken glass and other foreign debris is along roadsides, so I quickly learned to watch our for that as well. What I will probably do different next time is spend less time with the bicycle riders that just have flat tires unless they are in a dangerous location. I always stopped to see if the participant was ok, but next time I’ll likely just report it in so the officials and SAG vehicles know where these riders are and then quickly move on if they are ok. I tended to want to help them get going again, but there were just too many other riders that us motorcycle marshals needed to be looking out out for. Another lesson I learned is that just because you warn people of imminent dangers, it doesn’t mean they will listen. These big events are often run rain or shine. It pays to bring your rain gear with you. I only had a rain jacket and a pair of cold-weather gauntlet gloves. It rained so hard towards the end of the second day route that the entire event got stopped. There we were on the back country roads of Brunswick County, North Carolina facing what would become a record rainfall for the region. Thanks to the Calabash Fire Department for letting us in and for hosting the rest stop. I was glad to finally reach it there after being caught in the middle of that thunderstorm and heavy rain. Many of the bicycle riders got picked up by SAG vehicles in the thunderstorm. With the rain coming down so hard and with cracks of lightning so close, it was the first time of the really hot weekend that I was thankful to be wearing a full face helmet. I continued to be so as I rode for 4 plus hours home in the rain after the course was officially closed due to the storm. I normally try to avoid riding my Moto Guzzi California Vintage in the rain. I don’t enjoy riding in the rain (who does) nor do I enjoy the hours of clean-up afterwords. The Guzzi ran flawlessly throughout weekend, including the long wet ride home. The Givi trunk and the factory side bags kept all my stuff nice and dry. Having a windshield certainly helped too. 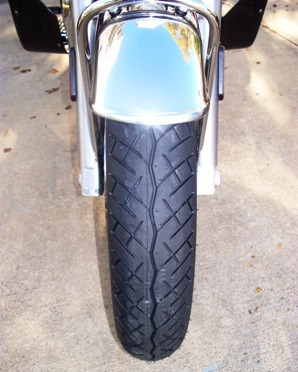 I discovered that riding with my feet on the passenger pegs kept my legs and feet out of the wind and rain while I was on the open highway. I realized once more that the unusual Guzzi v-twin engine layout benefits the rider in wet as well as cold weather. 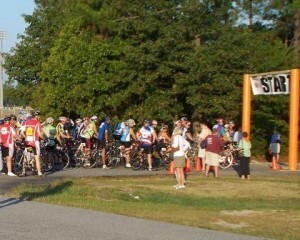 Over the course of both days I feel like I received 10 years worth of thank you’s from so many of the cyclists. Several of the bicycle riders told us that they felt good just knowing we were out there with them. Those cyclists rode their tails off to raise money for the National MS Society and to help put an end to this disease. They are the ones that deserve the thanks! For my 4th grader’s first computer-related paid job, I asked him to make a slide show video using some pictures of our Moto Guzzi California Vintage so that we could post it on this site and on youtube for fun. He did a great job. We hope you enjoy!